"We should not let political factors into this process." China’s government is seeking full access to Canada’s economy in free trade talks, a move that could result in Chinese state-owned companies bringing their own employees to work on projects in Canada. China’s ambassador to Canada, Lu Shaye, told the Globe and Mail his government wants to avoid discussions of human rights issues, fearing it could become a “bargaining chip” in negotiations. Additionally, China would see any attempt to block takeovers of Canadian companies on national security grounds as protectionism, Lu said. Canadian and Chinese officials held exploratory talks on a free trade deal earlier this year. Lu told the Globe another meeting will take place in April. Canada's ambassador to China, John McCallum, told the CBC that Prime Minister Justin Trudeau "is very clear that we want to pursue stronger ties with China. We think that in the medium term this will lead to more Canadian jobs." Many trade experts point out that the vast majority of China’s largest corporations are state-run enterprises whose executives are often hand-picked by government. They also note that China’s notion of “full access” to an economy could be very broad. As the foreign policy blog OpenCanada notes, China’s 2015 free trade deal with Australia includes a provision that allows Chinese companies to bring their own employees into the country to work on projects, so long as those projects are worth more than AUD$150 million. Charles Burton, an associate political science professor at Brock University, says bringing their own workers abroad is “normal practice” for Chinese companies. “It’s not as if [the Chinese] would be asking something of Canada that they don’t expect from other countries,” he said. Though China has been among the most vocal countries in resisting the protectionism of the Trump administration, critics say the country is itself a bastion of protectionism. They note China allows almost no foreign investment in banking and telecommunications. Many argue the country has not lived up to the commitments it made to open up its economy when it joined the World Trade Organization in 2001. China’s interest in Canada lies primarily in energy, and in the possibility of exploiting Canada’s oilsands, experts say. The country will push for a reversal of Harper government-era policies that restricted the ability of Chinese state-owned businesses to invest in Canadian energy. Opinion polls suggest Canadians are split on the issue of free trade with China. One poll carried out for the Asia Pacific Foundation of Canada last August found 46 per cent support for a deal with China, and the same percentage opposed. However, that was a stronger showing than a poll six months earlier, which showed only 36-per-cent support for a China trade deal at that time. 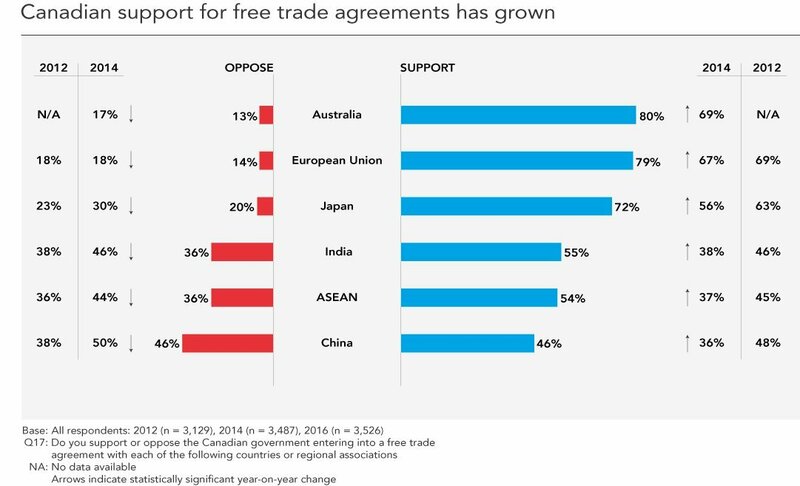 Canadians were much more likely to support free trade deals with more developed economies, such as the European Union, Japan and Australia.